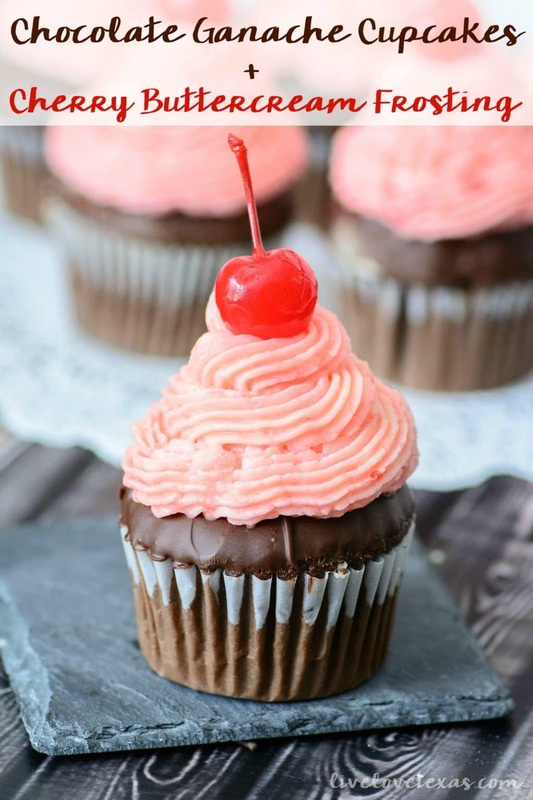 This chocolate ganache cupcakes recipe is perfect as is but even better when topped with this cherry buttercream frosting recipe! My granny will be 88 years young this summer and one of her favorite candies to this day is chocolate covered cherries. She can’t get enough of those things around Christmas and Valentine’s Day. If you’re ever short on ideas for a gift, throwing a box of chocolate covered cherries into the mix is always sure to please. I adore those cheap boxes of chocolate covered cherries too. Or, cordial cherries if you will. There’s something about biting through that thin shell of chocolate and revealing the oozing juices of the cherry inside that just reminds me of time spent with my granny. These days I don’t enjoy chocolate covered cherries much. My husband is just not a fan, which means if I buy a box I’m responsible for eating the entire thing (Granny lives in Florida). 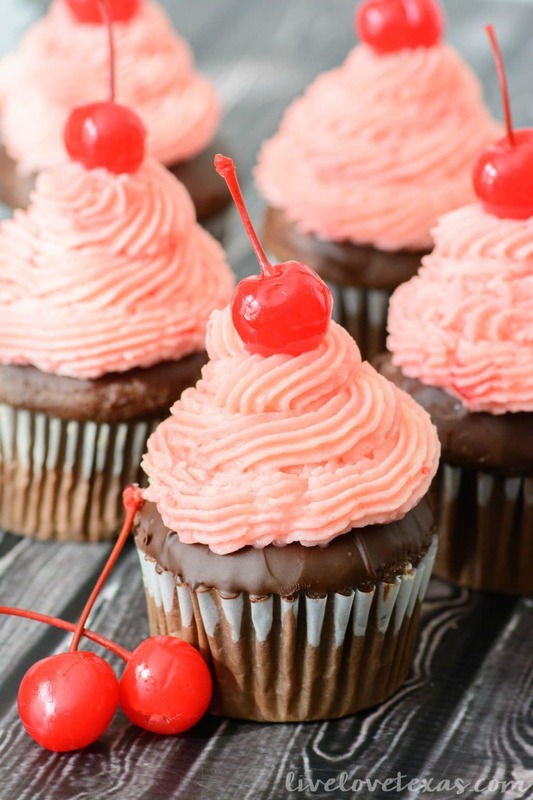 Since I’m not inclined to indulge alone, why not make something the entire family can enjoy like these chocolate ganache cupcakes with a cherry buttercream frosting? In full disclosure, this is not a formal chocolate ganache of chocolate and cream. But since I’m all about shortcuts and informality, this definitely does the job for me! 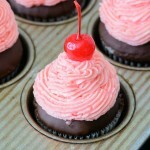 Chocolate cupcakes topped with a chocolate ganache, cherry buttercream, and a real maraschino cherry? Granny would be proud. And the beauty with these cupcakes is they’re so easy to make and perfect for Valentine’s Day or any time of year. Love cherries? 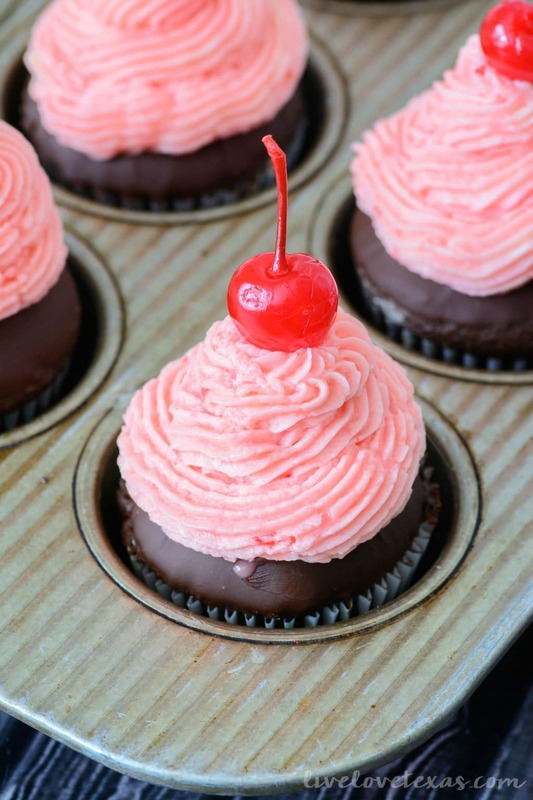 You’ll want to check out this collection of the Best Cherry Dessert Recipes! In a medium bowl combine flour, sugar, cocoa, baking powder, baking soda, and salt. Add milk,cherry juice, oil, eggs, and vanilla to flour mixture and mix together on medium speed until well combined. Scoop 1/4 cup of batter into cupcake liners and bake for 18-22 minutes or until a toothpick inserted in the center comes out clean. Melt the dark chocolate chips over medium heat or in the microwave in 30 seconds intervals, stirring each time. Once chocolate is melted, dip the top of the cupcake in the chocolate. Have you tried your hand at a chocolate ganache cupcakes recipe? Do you have any tips?